After dropping my car for service, took the Pallavan (prefer to still call it like that 🙂 )bus back home. I got seated behind the driver and was watching him closely as he drove on the lattice bridge road. It was a seat poorly maintained, all the cushion had worn out. There was a seat belt holder to my surprise, but the belt was no where to be seen. An old coke bottle had water (probably drinking water for him) and was on the seat below him in the sun, it will definitely be hot when he drinks it. The gear lever was getting stuck a bit, but he was managing with it. Two wheelers were raving from left to right and in all directions and he was patiently driving. This driver was a very patient driver. How many times would we have got so irritated about a MTC/Pallavan driver driving rashly and not minding the signals also! !…it is true ofcourse, but considering the pathetic state in which their work environment is, we need to spare a thought for them also. This is not the actual image of the bus in which I traveled but similar to this and the same view point. 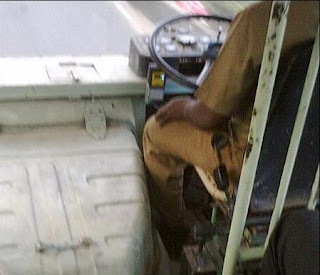 With such poor seats, levers not in proper shape, it does take so much strength to continue working in such situations. In spite of having the luxury of having nice cars with air condition, I always believe that traveling by bus in sitting mode is the best way to travel, so comfortable, no need to worry about the traffic. Just that the process of getting one, waiting for bus makes it difficult. Still will always cherish the Pallavan rides!!! Isn’t it time that the situations are made better for them, which will make the roads more safer and comfortable to drive?…..I enjoyed the ride and had these in my thoughts as I got down at my stop and move on. Being in the driver’s seat is always mentioned as an idiom to enjoy things and be in control, this is one driver’s seat that you don’t want to be in!!!!. Happy driving folks, drive safe!!! This is a good post. I too have wondered many times, what if MTC driver seats are also made better & comfy like our private bus driver seats & neatly maintained. Driving in crowded seats & fully loaded in this hot climate needs phenomenal patience & Perseverance.